ANDERSON DYNAMICS is a start-up component trike company developed to manufacture, assemble and market component trike kits and turnkey vehicles. The RktshpTM (Rocket Ship) is a two seat, high performance, lightweight, mid-engine, three wheel vehicle, or trike. Having a desire to build an outstanding three-wheel vehicle, Carey Anderson set out to design a trike based on the physics of vehicle dynamics. 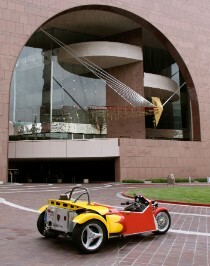 Using a front wheel driveline and relocating it to the back of the vehicle, for desirable weight distribution and a favorable center of gravity, resulted in a mid-engine trike. To keep the vehicle stiff, light and strong he used a tube space frame, which allows the vehicle to maintain its lightness while adding strength and safety. Not having any front suspension designs available that he felt would work in this application a new design was needed. Carey then designed and patented his own front-end suspension based on equal length control arm geometry. This resulted in keeping the tire at its optimum footprint at all times, with superior handling, and comfort. The result has been the birth of the RktshpTM. Being classified as a motorcycle, one occupant may drive in the HOV lane, fuel mileage is excellent at 45+ mpg, you don't have to hold it up at stops and it won't fall over, and we believe will be the best value for the money on the market. With its weight distribution, low CG (center of gravity), small frontal area, cleaner aerodynamics and optimized patented front suspension the RktshpTM is a highly desirable, and outrageously fun vehicle to drive, and is completely unique. The RKTSHPTM, take it anywhere. Our mission: is to combine the fun and excitement of a trike with the high performance of a sports car and the fuel efficiency of a small lightweight vehicle, offering great value and outstanding customer service.